When you record video footage on an AVCHD digital camcorder, the captured footage appears as an MTS video file, a format most media players and video-editing programs don't recognize. To edit and upload the AVCHD (MTS/M2TS) files on Mac, changing it to M4V would be a good idea as M4V is a standard file format for videos for iPods and PlayStation Portables developed by Apple. It is based on the MPEG-4 AVC video codec, and it is also used by QuickTime. You could use M4V file freely in the Apple world, from Mac to portable devices like iPhone, or to its apps like iMovie. iFunia Video Converter for Mac is a good video converter to convert MTS to M4V on Mac. It fully supports macOS 10.13 High Sierra. Launch iFunia Video Converter for Mac. Import the MTS videos by clicking Media Browser icon at the upper right corner to add MTS files. You can also drag and drop files. Now you can find the selected M2TS videos in file list. You may select any of them and click play button to preview. 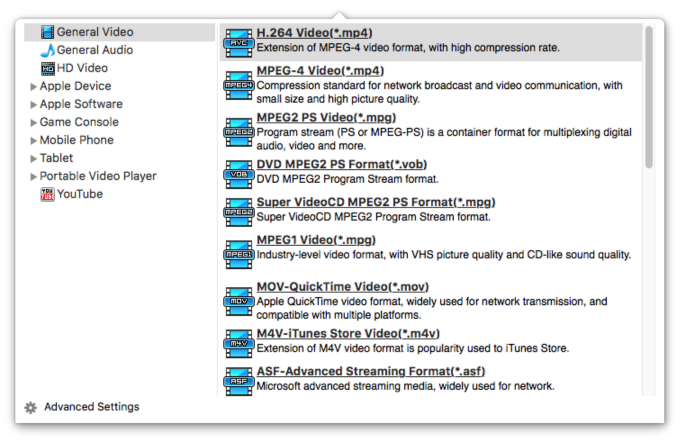 After you added MTS files, you can select M4V as the output format for each video file. This video converter developed by iFunia also supports many other input and output formats. Take MTS to MP4 for example, if you need to convert MTS to MP4, you can select MP4 as the output video format. You can also change the output settings as you need. Remember that the output file size mostly depends on the Bitrate you set. Larger Bitrate, larger file size. Tips: To personalize your video, you can also click "Edit" to add picture or text watermark with customized transparency, size and position in your videos. For people who want to output 1 single file for easily playing on their portable device, simply click on the video titles which need to be merged, then click 'Merge' button at the bottom of the app. Click the conversion button and the selected MTS files will be converted to M4V files at once. iFunia Video Converter for Mac supports batch conversion so you may load multiple M2TS and MTS files and convert them to M4V at one time.